Lynch when she was in Iraqi custody. Okay, so I'm having trouble posting because of all the traffic on the server -- which is GOOD, I suppose, except that it's making it hard for me to post. So I'm just going to fight to get this post up for a while, with links to the directories of everything. And then I'll try to get the posts up one by one later today. 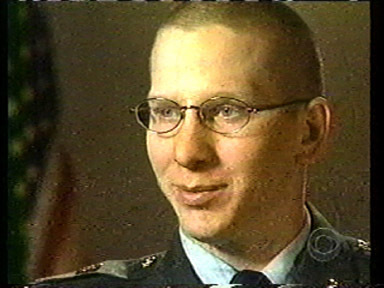 The real hero of the Jessica Lynch story, and how the Shrub Administration actually covered up his heroism in order to peddle their false story about Jessica Lynch's rescue. 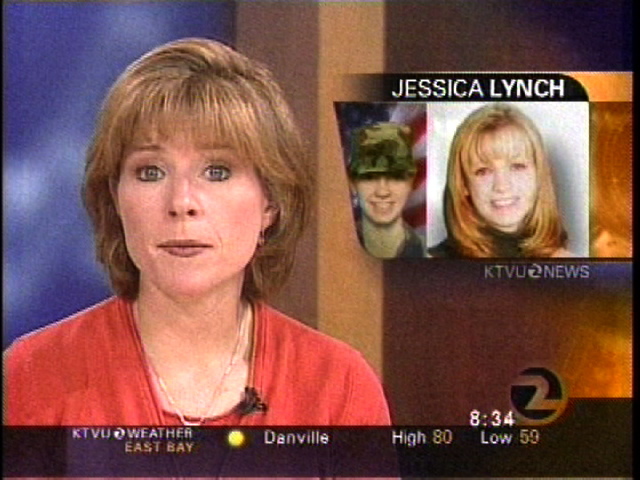 Jessica Lynch Says: "They used me to symbolise all this stuff. It's wrong." By Edward Helmore for the Guardian Unlimited. Beneath the gloss of the US media and the machinations of an administration eager to show a 'good news' angle of the Iraq conflict against the reality of a rising body count, Lynch has become a metaphor not for the heroism of pretty young Americans captured by a devilish foreign enemy, but for the confusion that has marked Bush's Operation Iraqi Freedom from the start. Misgivings characterising Lynch's story are coming to a head: last week she accused the administration of manipulating her story for propaganda, saying she was not a heroine at all; accusations that she'd been raped were disputed by appalled Iraqi doctors who first treated her, and the army was accused of insensitivity and racism for awarding Lynch a full disability pension while others from her ambushed maintenance company, including Shoshana Johnson, the black cook wounded and captured by Iraqis, will receive barely a third of Lynch's discharge package. While Johnson is living on $500 a month, Lynch stands to make millions from her book, I Am a Soldier, Too. She has been romanced as the media target of the moment, photographed by Annie Liebowitz for Vanity Fair, and stands to make millions more from a movie deal. Lynch says the circumstances of her rescue was dramatised and manipulated by the Pentagon. She was not rescued in a 'blaze of gunfire' as reported by Defence Department officials last April, but picked up from compliant Iraq doctors who had saved her life. She was not raped, as the department said, and the Iraqi, Mohammed Odeh Al-Rehaief, who was given US citizenship for his efforts, has written a book about how he risked his own life to win her freedom. Now he is described by his wife as overly influenced by John Wayne movies. When American Private Jessica Lynch was rescued from an Iraqi hospital last April, President George Bush's administration and much of the US media was gripped by a dramatic tale of blonde, all-American heroism. The story reaches fever pitch this week with the publication of Lynch's autobiography, a dramatised TV documentary, interviews and a Vanity Fair cover story. And America is deter mined that Lynch will be a heroine, despite the fact that she never fired a shot, and instead got down on her knees to pray as her unit was surrounded by enemy forces. As she pointed out herself, it was her dead colleague Lori Piestewa, a Native American mother of two, who went down fighting. But the story may be too far along to reverse. 'She can't take back being a star. The fact that she says it's all made up doesn't make a difference. It's been decided she's a star, and that's the only indisputable fact,' said Wolff. The New York Times has pointed out how Lynch has become the Mona Lisa of Operation Iraqi Freedom. Americans have been able to read into her unrevealing snapshot whatever story they chose. Her story becoming 'a Rorschach test for homefront mood swings'. Now, with the US forces having lost 32 soldiers in the last week alone, the mood may be turning and she stands to be come symbolic of US confusion and press credulity. The inconsistencies have not been missed by veterans' groups who don't wish to besmirch her individual valour but are uneasy over the administration's efforts to present 'good news' while ignoring the reality. 'The White House sent a message that they were going to tell the good news stories so now we have a situation where we are not allowed to witness the coffins coming home and there are no images of young soldiers coming home missing arms and legs,' said Steve Robinson of the National Gulf War Resource Centre. 'We're just seeing one side of the story, and you've got to tell the other side, the one about the wounded, maimed and the dead.' There is growing doubt Lynch's uplifting story will help to sweeten the nation's mood about the dim prospect that the US will be able extricate itself from Iraq before hundreds, and possibly thousands, more servicemen died. 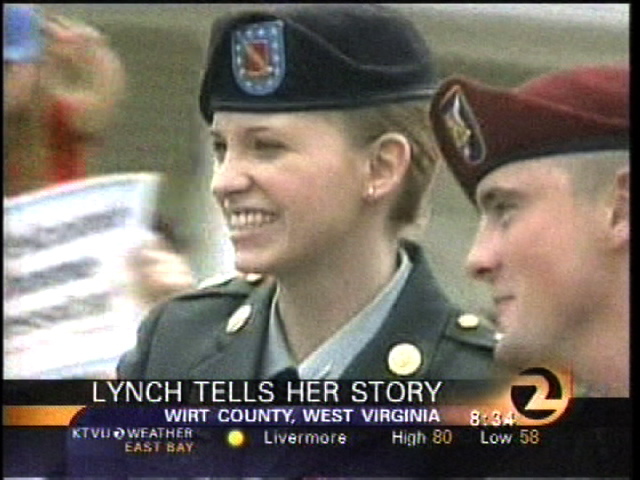 Lynch, who joined the army hoping to see the world after failing to land a job at a supermarket, is preparing to go on a media tour that will include appearances with TV anchors such as David Letterman. Yet she is unable to fulfil the role of the patriot. The administration's game plan, enabled by a supplicant media, is showing signs of distress. The singer Cher recently visited the hospital where Lynch recovered from her ordeal and talked on TV of meeting a teenage soldier who had lost both his arms. She wanted to know why Bush and his team weren't there having their photographs taken with the injured troops. 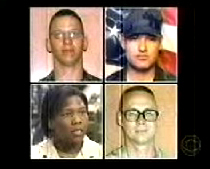 'I don't understand why these guys [the wounded] are so hidden and there aren't pictures of them,' Cher said.